The history of the American West is a history of struggles over land, and none has inspired so much passion and misunderstanding as the conflict between ranchers and the federal government over public grazing lands. Drawing upon neglected sources from organized ranchers, this is the first book to provide a historically based explanation for why the relationship between ranchers and the federal government became so embattled long before modern environmentalists became involved in the issue. 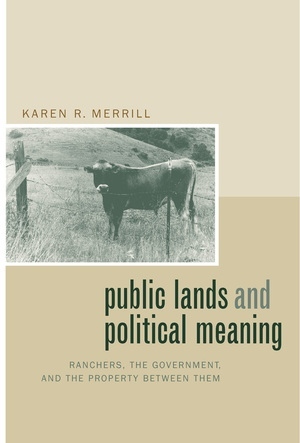 Reconstructing the increasingly contested interpretations of the meaning of public land administration, Public Lands and Political Meaning traces the history of the political dynamics between ranchers and federal land agencies, giving us a new look at the relations of power that made the modern West. Although a majority of organized ranchers supported government control of the range at the turn of the century, by midcentury these same organizations often used a virulently antifederal discourse that fueled many a political fight in Washington and that still runs deep in American politics today. In analyzing this shift, Merrill shows how profoundly people's ideas about property wove their way into the political language of the debates surrounding public range policy. As she unravels the meaning of this language, Merrill demonstrates that different ideas about property played a crucial role in perpetuating antagonism on both sides of the fence. In addition to illuminating the origins of the "sagebrush rebellions" in the American West, this book also persuasively argues that political historians must pay more attention to public land management issues as a way of understanding tensions in American state-building. Karen R. Merrill is Assistant Professor of History at Williams College and editor of The Modern Worlds of Business and Industry: Cultures, Technology, Labor (1998). 4. The Sovereignty of the State, or the States? 5. The Taylor Grazing Act and the "Vast National Estate"